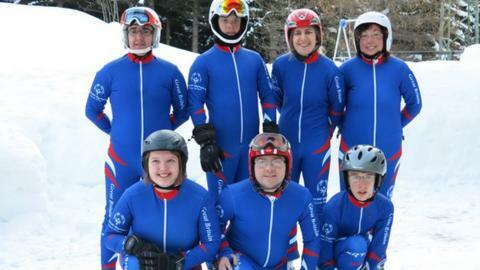 British competitors came away with 13 medals, including six golds, from the Special Olympics Winter Games in Pyeongchang, South Korea. There were three medals apiece for Welsh teenager Elizabeth Allen and Robert Holden from Lancashire. Kent pair Jane Andrews and Wayne McCarthy won two golds and a gold and silver respectively in their categories. There were also two bronzes for Clare Lines and one for Mikael Undrom. Allen, who, like the rest of the seven-strong team had earned their places on the team thanks to their performances at the National Alpine Ski competition in Pila, Italy, triumphed in her super-G and slalom races but she had to be content with silver in the giant slalom. Holden had won silvers in the super-G and giant slalom but put in a strong performance in his final event, the advanced slalom, to win gold. Andrews was in superb form in the giant slalom and slalom races in her category while McCarthy, who had overcome a bout of illness earlier in the competition, was victorious in the giant slalom and runner-up in the slalom. Lines worked hard for for her super-G and giant slalom bronzes while Undrom got bronze in his super-G race. Over 2,800 athletes from 100 countries took part in the competition which also featured cross-country skiing, figure skating, floor ball, floor hockey, short track speed skating, snowboarding and snowshoeing.